Huda Lutfi, Still. Installation view. Image courtesy of The Third Line. There is a sense of order to the collection of works in Huda Lutfi’s latest exhibition that belies the chaos usually associated with her practice. Small, neatly framed, and minimalist paper works run at eyeline around the space. They are at odds with the playful, figurative collage pieces that filled The Third Line gallery during her last show in 2016, which spoke of the social and political structures in Cairo—her home city that she says is her “constant inspiration”. However, the departure is not as stark as one might initially think. As a cultural historian continually interested in the relationship between the state and the wider public, even an exploration into her own psyche has some kind of collective reflection. In her essay on the exhibition, author Sara El Adl picks up this thread calling Lufti’s moment of stillness one that speaks of ‘a general sense of disillusionment’ across the city. Perhaps then, it is an opportunity to stop, meditate and redress the balance. Huda Lutfi_#14, 2018. Acrylic, oil pastels, collage on paper, 20 x 17.5cm. Image courtesy of the artist and The Third Line. For Lutfi, the process of making each of the works in this exhibition was all about achieving balance. For the paper works, which she calls ‘paper sculptures’, she took herself back to a former series from 2001 entitled Movements of the Alif, physically destructing those pieces to make these new ones. Initially, the series was an experiment with abstract paintings inspired by the first letter of the Arabic alphabet (alif). In their new iterations, the original paintings have been cut up to make new collages, layered upon each other to form abstract formations. However, and somehow, there is still an emphasis on textual shape. Albeit entirely illegible, at first glance some of the works appear to be lines of text whilst others appear figurative, at least as if the shapes are familiar to the eye. Huda Lutfi. Difficult to Unravel, 2018. 89 flax thread rolls painted in metallic silver, 120 x 100 cm. Image courtesy of the artist and The Third Line. “Some of the pieces came to me immediately and others took days to complete,” explains the artist. “I was searching for a feeling of balance.” Look to the floor then, and that equilibrium is thrown into question with the sculptures. 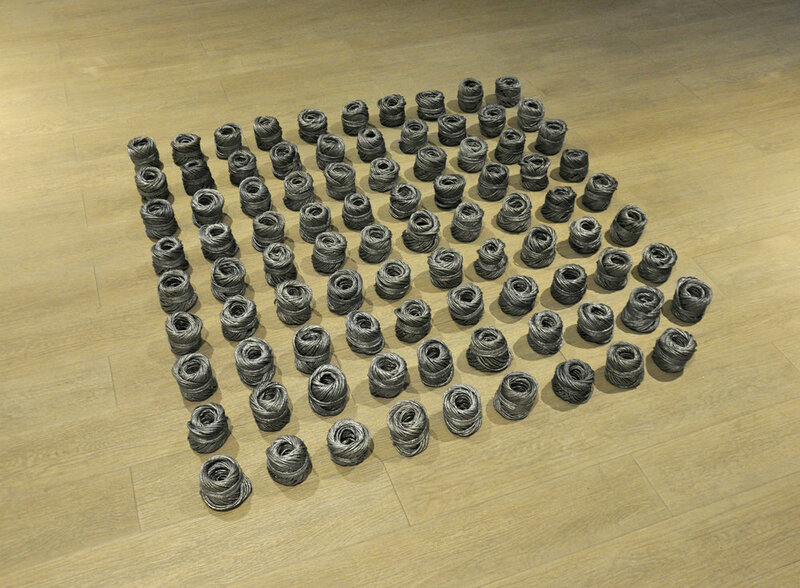 In Difficult to Unravel (2018), Lutfi presents a grid formation of 89 flax thread rolls painted in metallic silver. The piece is an exploration into disintegration; where the flax would unravel in her hand before it was sprayed with silver, it enters a state of solidity afterwards. This is an act against emotional disintegration but yet, look again and see that the grid structure is missing one piece. “The answer to this question is that life is not perfect, we always have a feeling that something is missing and although we seek to overcome this feeling, we never can. So, this is an exploration of the mental and psychological state of mind that keeps us seeking balance,” Lutfi explains. In another sculpture, Hanger (2018), a thin piece of leather (also painted in metallic silver) hangs from a slender brass hook. “This has to do with death,” says Lutfi emphatically. “If silence is death, then it is a celebration of that.” This brings into question her use of silver. All the sculptures are painted in silver and the majority of the paper works are laid upon a base coat of the same colour. “Silver is a spiritual colour for me,” she says. “It is about finding your ground and also, stillness." This is clearly the thread running through the show – itself titled Still – and to fully appreciate the works, the viewer too must stop, think, and meditate. The quietest work in the show is Silent Diary (2018), a scroll of recycled paper painted in silver tossed onto the floor. “This is my final point; the loud silence,” says Lutfi. The diary pages are empty and therefore silent, yet between the silver pages is one painted in bright red. What does it say? What does it mean? The answer is nothing and everything. The most important message of this piece is that you take time to notice it. Silent Diary (2018). Courtesy of the artist and The Third Line. Rolled up at your feet and with seemingly nothing to say, it is easy to overlook it, to walk past it and to even accidently brush it with your feet. The artist is arguing that is precisely the nature of silence—at the beginning it is easily overlooked, yet with time and as it goes on, you have to pay attention. In this show, it is this piece that eventually gets that message across. Huda Lutfi: Still. November 12 - December 27, 2018. The Third Line, Alserkal Avenue, Dubai.